Vivianna Torun Bülow-Hube know as Torun, was born 1927 in Malmo, Sweden. Her father was director of town planning in Malmo and her mother was a sculptor. Torun was the youngest of four children, born after a gap of nine years. All four children pursued artistic careers with a brother and sister becoming architects and another sister, a poet. But it was Torun who became the most famous, as the first woman silversmith in the world to gain international recognition. Torun studied at Konstfack, the School of Arts, Crafts and Design in Stockholm, beginning in 1945 while pregnant with her first child, Pia. Eventually she married the child's father, a Danish journalism student. In 1948, Torun spent the summer in Paris meeting Picasso, Braque, Matisse and the other great artists of the day. She married a French architect and lived in Stockholm until 1956 having a second child, a son, Claude. 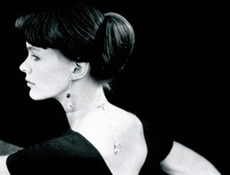 As early as 1952, Torun exhibited her jewelry, made both in Stockholm and France (and bearing hallmarks from each country) in Paris. In 1956 she moved to France with her third husband, Walter Coleman. She designed jewelry for among others, Billie Holiday which Holiday wore when she performed. The couple moved to Biot in the south of France .Torun produced many pieces during this period when young Swedish silversmiths would come to work in her studio, introducing her to new techniques. Torun renewed her acquaintance with Picasso who lived in the area and an exhibition of Torun jewelry was held at the Picasso museum in Antibes from 1958 to 1960. On November 5, 1992, Torun was awarded the Prince Eugen medal by King Carl XVI Gustav of Sweden. The medal ia bestowed for outstanding artistic achievement. "It is a search for the source, the simple and natural, that impels Torun's creative work. Inspired by the art of primitive cultures, African, Oceanic, Egyptian, she creates her forms not for the sake of beauty alone; but carefully considers both the form and function of each piece of jewellery she makes. A practical detail such as the fastening is not concealed but on the contrary accentuated. She subscribes to the philosophy that what is functional is also beautiful". Torun.